For me, the best books are ones that create immersive new worlds for me to inhabit. This one opens up the cosmos to build a fun and funny adventure starring a brainy, socially challenged girl of color. What could be better? Guardians of the Galaxy meets The Hitchhiker's Guide to the Galaxy in this wild, warm-hearted, and hilarious sci-fi debut about a brainy young girl who is recruited for a very special boarding school. Nikola Kross has given up on living in harmony with classmates and exasperated teachers: she prefers dabbling in experimental chemistry to fitting in. 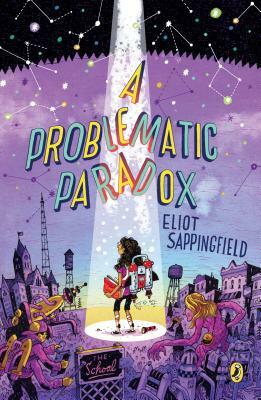 But when her life is axially inverted by a gang of extraterrestrials who kidnap her dad and attempt to recruit her into their service, she discovers he's been keeping a world of secrets from her--including the school for geniuses where she's sent for refuge, a place where classes like Practical Quantum Mechanics are the norm and where students use wormholes to commute to class. For Nikola, the hard part isn't school, it's making friends, especially when the student body isn't (entirely) human. But the most puzzling paradox of all is Nikola herself, who has certain abilities that no one understands--abilities that put her whole school in greater danger than she could have imagined. Eliot Sappingfield was last seen wearing a blue shirt and khaki pants in the vicinity of his home in Missouri. He is known to appreciate stories, science, and various other geeky things. He may or may not be accompanied by his wife, his two daughters (when they don't have anything better to do), or a goofy basset hound. He is considered unarmed and not terribly dangerous. This is his first novel.